Christmas is coming – Here we gooooooooo snow. Today has been rip roaring lovely white snow with big flakes. 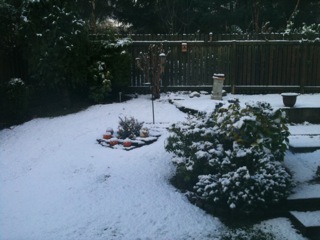 The kind of snow that is pretty to watch, and children just love to play in. 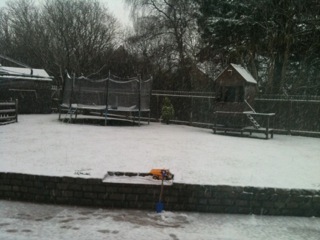 We do lots of sledging in the snow when it comes, so today is not the best day for it to happen. It’s a school day, and as all the children come out of school, there will be snowballs a plenty, whizzing by parents heads as they wait for their own little cherubs to come out of school. For my own boys, It will mean that by the time they reach me, they will be soaked through to the skin. I have two very hyperactive boys to pick up, and they will use the slope to get out of the school playground instead of the path that winds to the top (as boys do). They will both slip many times on the way up the slope, and end up on hands and knees in the slushy snow (which by this time will be mixed in with the mud slurry that used to once be a grassy slope). They will of course, have their jackets stuffed into their schoolbags, which will be bursting at the zips to stay closed, and their hats will be at the bottom of their bags, along with the half open, and spilling trail of a bottles of water that they are required to take to school every day, but which get used at playtimes as water pistols, or mud dubs makers. They will, however, have managed to fish out their gloves from the other eclectic mix festering at the bottom of their schoolbags so that they can throw snowballs. When we get home, there will be a quick change out of soaking school clothes into fresh play clothes, which will also be soaking wet half an hour later by the time son number three arrives home, and then they’ll want to go out again. They have perfectly good salopettes in the cupboard, but think it’s not cool to wear them unless they are sledging. More wet clothes. There has been just enough snow for their Costco bodyboard sledges to go bombing down the big hill at the back of the house, but sadly, mum here does not have the time to take them until Friday after school. This will be a huge #mumfail, but I’ve got the carrots out and ready for them to make this years first snowman. And I will be the one out there throwing snowballs at my little cherubs while they roll the snow to make that snowman, before I need to get changed and go to a parent council meeting at the school. Cue more changes of clothes. TIme for my washing machine to really see what it is made of this year. It’s a new one, but can it cope with a scottish winter? ?